In the interests of commerce, sometimes shortcuts occur. Businesses vying to get their products to consumers in an increasingly competitive market can mean that distributors are overwhelmed to meet deadlines. Often, this translates into goods being overloaded into commercial trucks beyond their capacity. Numerous trucks on our nation’s highways are carrying cargo exceeding legal limits. These same trucks are setting up dangerous scenarios with the other vehicles sharing the roads. Unstable and unsteady loads can lead to deadly trucking accidents on our highways. Because of the size, weight, additional stopping distances, and clearance a truck requires, those in other vehicles should always be mindful to maintain a safe distance. 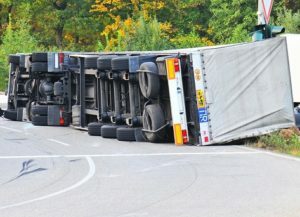 If you or a loved one has been involved in a truck accident and sustained serious or fatal injuries, contact a Denver Co trucking accident lawyer from the Law Office of Richard J. Banta, P.C. right away to obtain comprehensive representation to determine if you can file a case seeking damages for your injuries. The desire to ramp up profits and bolster bottom lines is leading to the high rate of overweight trucks and uneven loads. But so is increased population. More shoppers equal an increased flow of commerce on highways throughout the state. Just one overweight truck can cause as much damage as hundreds of cars traveling on the same route. Due to the sheer enormity of tractor trailers, if their load is overweight and unstable, the smallest road condition makes them difficult to control. Rollovers are a common occurrence. Large trucks have large blind spots and make wide turns which also increase the risk of accidents. Driver fatigue, poor vehicle maintenance, road and weather conditions, together with the way the truck was loaded can contribute to horrific accidents. Commercial truck accidents are very different from accidents that take place between passenger vehicles. The obvious size of a truck as compared to a passenger vehicle usually means the people in the car are more likely to suffer catastrophic personal injuries. Injuries and damage when a commercial truck is involved tend to catastrophic, if not fatal, and the devastation victim’s lives forever. Broken bones, lacerations, brain injury, spinal cord injuries, amputations, and death are a grim reality on highways throughout the state. If you or a loved one has been injured in a truck accident as a result of someone else’s negligence, you should first contact a law firm with experience handling personal injury cases. It is also important to find a firm that understands the intricacies of litigating truck accident cases. Aligning yourself with an experienced firm enables you to have the best chance of success. Contact the Law Office of Richard J. Banta, P.C. today to set up a free case evaluation with a skilled trucking accident lawyer Denver CO victims turn to today.